The Pet Water Bottle is perfect for giving water to your pet on-the-go. You can give them fresh water in the park, outdoors, beach or anywhere. 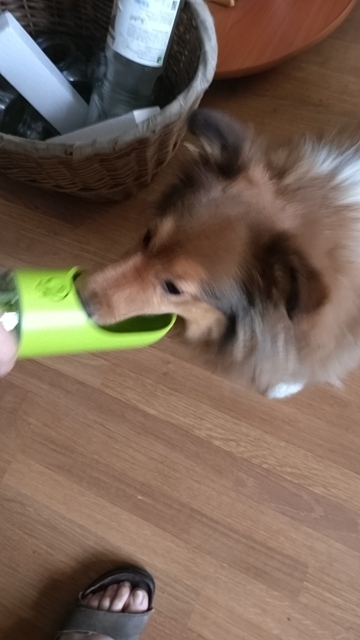 The special bottle has a wide bowl which is perfect for pets to drink out of. Water is stored in the bottle and can pass back and fourth from the bowl so you won’t ever waste any. It’s also leak proof and has a nifty filter. Activated carbon removes impurities and reduces the chlorine from direct drinking tap or cooled boiled water. The replaceable carbon filter is equal to 100 single-serve water bottles, which is more economic and environmental-friendly. Strong Antibacterial Effects. Adsorption of impurities. During your travel, it can supply sufficient clean water to keep your dog hydrated. Buy Now & Get 30% OFF Your Smart Pet Water Bottle. Hurry, Get One For Yourself and For Someone Who Loves Their Pet Before Sale Ends! Not Sold In Stores. 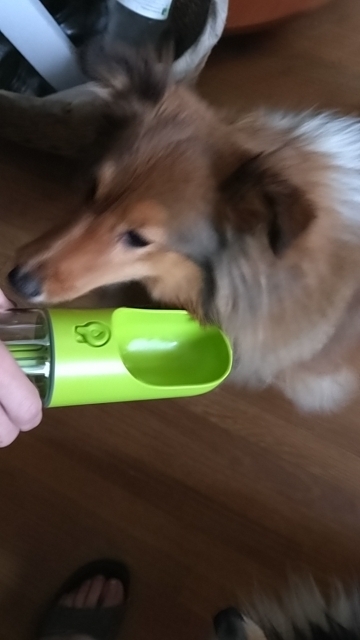 It designed ergonomically to make it easier for dogs & cats to drink. When the button is on the left, press it and water will come out. HURRY, GET YOURS NOW! FREE SHIPPING TODAY ONLY! Excellent product. It fits in my drink holder on my fanny pack. The trough is a little narrow but my medium-sized dog is adapting. This is an extremely well made and should last a long time. It meets a real need for exercising with my pooch! Great sturdy product. A little larger than I wanted but nevertheless a good size for a big dog. 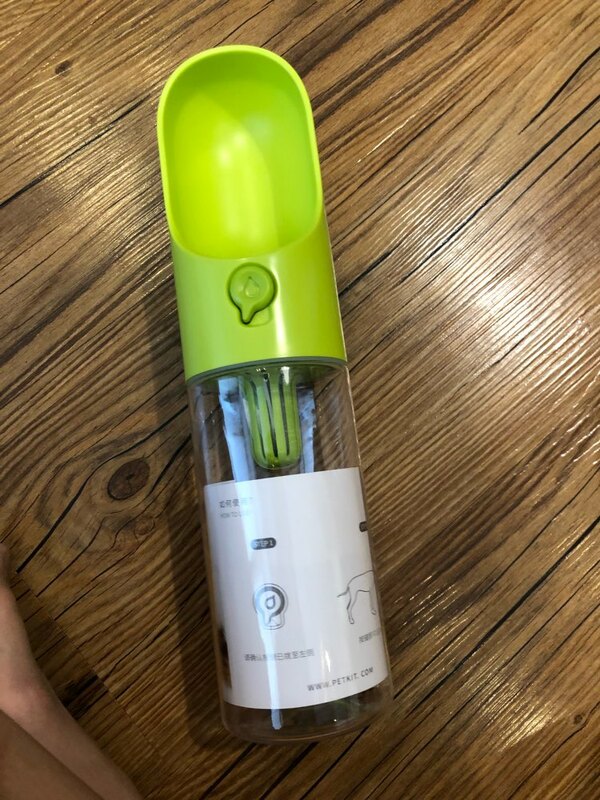 I use this when I take my two dogs on walks and I love that I don’t have to bring a water bottle and and bowl it’s all in one and like that the water can go back into the bottle if they don’t drink all that you pour out so you don’t waste any for the long walks. good thing. fully compliant with the description. have carbon filter, the unforeseen circumstances. immediately dog approved. excellent design, good performance. recommend. My dog and I always go for long walks and it’s a pain to carry a bowl and a bottle of water . This is exactly what I was looking for and my dog absolutely loves it . Easy and simple to use . 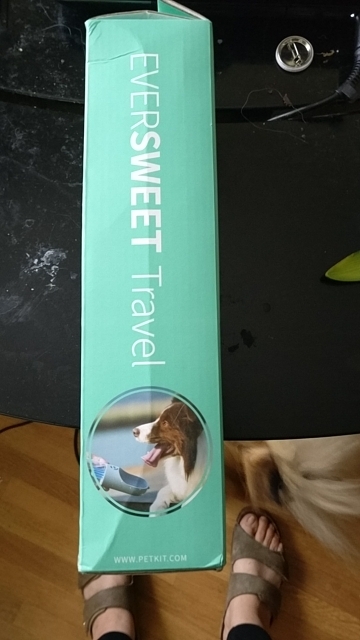 This dog water bottle is not just another water bottle. It is designed with Fido in mind. It even FILTERS the water with a carbon filter. The bottle comes with three carbon filters to keep you supplied for quite some time. The documentation inside the bottle was not in English but my wife reads Chinese. It says to replace the filter every 2 months or 100 bottles. That should keep you through the season. The filters should be rinsed for 2 minutes before first use. The bottle is well-made and has a very nice design. The fact that I can just push a button to get water to come out for my little dog is really a good feature. The bottle does not leak at all. The green bowl/lid material is very slick and the water just slides right off making it dry instantly. This means you can put it directly into a backpack or bag after use without having to dry it. The included lanyard makes it easy to carry. If you have a big dog, you could even attach it to their harness. We’ll be using this bottle all summer long and beyond. It is great for the park or road trips. 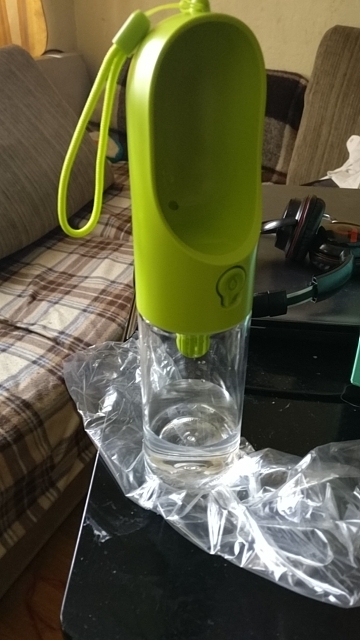 Lots of searching and reading reviews led me to this water bottle and, having now used it on daily walks, I am very happy with my choice! 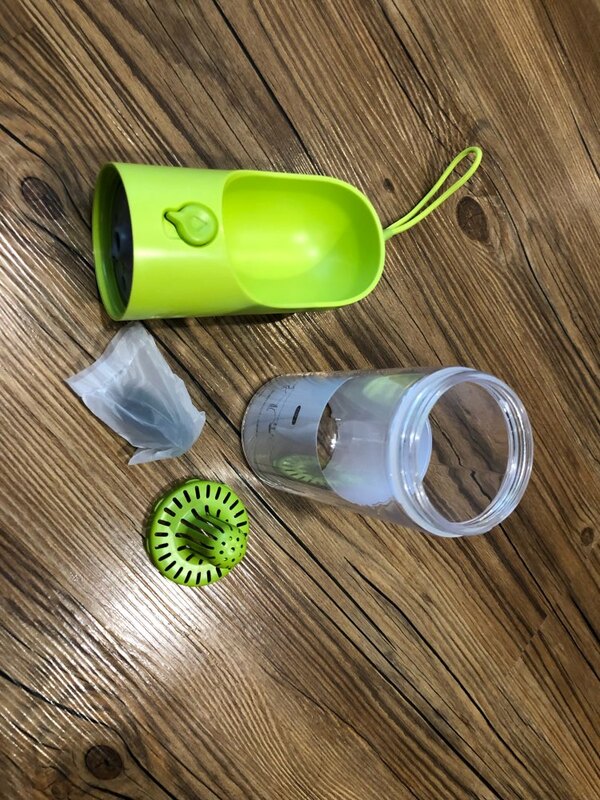 It doesn’t leak, can be used with one hand, my dogs are able to drink from it easily and also at the same time. I have small dogs (12lbs and 9lbs). An easy click to the side locks the button and when unlocked, an easy press of the button sends water into the drinking area. 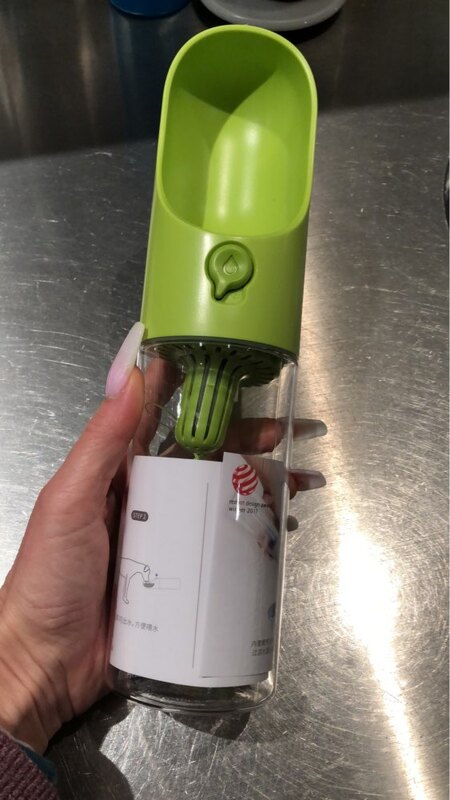 Holding the button continues the water flow, releasing stops it, and holding the bottle upright and pressing the button sends the water back inside. 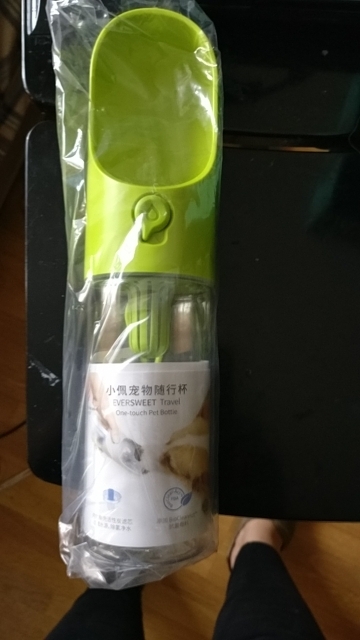 I haven’t used the filters, mainly because the directions for use are in Chinese and since I can’t speak or read it, I decided to leave them out, and the bottle works fine without them. There is a very thin cord that goes through a teeny hole at the top, to use to attach the bottle to a leash or whatever you need. It seems quite sturdy but it is thin and hopefully it won’t break! The hole on top is so small, I’m not sure what I would use as a replacement. It would be great if this also had a clip or some other way to attach the bottle. For every day, 2-3 mile walks in reasonable weather, the amount of water this bottle holds is perfect. In hot weather and/or for long outings or hikes where I wouldn’t be able to refill, I would probably take extra water.